THE history and architecture of Wells will be the inspiration for artist Ruth Ames-White to create a walkable mosaic map of the city centre that is set to become a landmark in its own right. The giant mosaic will have a diameter of six metres, will be made from an estimated 750,000 tiles, and will take more than three years to complete. 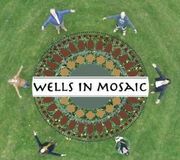 Mendip District Council has given permission for the mosaic to be sited near the bandstand in the Recreation Ground, and fundraising for the Wells in Mosaic project, which is expected to cost in the region of £80,000, has now begun. The group behind the project include Chris Winter and Philip Welch of Wells Civic Society, Steve Wilson of The Square soft play centre and Steve McKay of Jaypeg design and marketing agency, as well as Ruth and her husband Ian. “Steve Wilson came up with the idea of a walkable mosaic map and I think it’s wonderful. To be given the task of designing and creating it is a huge privilege and one I hope I will do justice to,” said Ruth, an artist all her life who became hooked on mosaics after trying them when her youngest son started school 14 years ago. The centre of the mosaic will depict the city centre. This will be surrounded by a ring of water with images such as the moat swans and Wells Boat Race, and then an outer ring of 32 gothic windows containing, for example, a crest, a person or a piece of history. Ruth will construct the mosaic in her home studio, a process that will involve cutting 2cm tiles by hand into pieces and sticking them on to paper designs. The completed segments will eventually be reassembled on the site. The couple gave a presentation on the project at the latest meeting of Wells Civic Society, when society chair Chris Winter handed over a generous cheque for £5,000 so that work can begin. “The civic society has been very enthusiastic in its support for this wonderful public art project since its inception and through the necessary planning and design phases,” said Chris. Barclays Bank; account number: 13873609; sort code: 20-99-40. 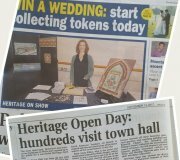 I was delighted to be invited to take Wells in Mosaic to the Heritage Open Day in Wells Town Hall on Saturday. It was busy all day with nearly 600 visitors, the majority of whom visited our stand to find out more about the project. "Ruth Ames-White, who is the artist and inspiration behind the Wells mosaic, whose future is now a certainty and will be in the Recreation Ground, showed off some of the panels that she has started and which when completed will add a new feature to Wells' heritage to sit alongside the other wonderful heritage that Wells can boast of." Volunteers from the Wells In Mosaic team walked the whole of the city's historic street pattern on Friday. This will help to distinguish the buildings which will be depicted in the six-metre diameter mosaic planned as a major attraction and guide to the city's historic gems. Supported by Wells Civic Society and Wells Lions, this ambitious project already has the support of other key organisations in the city and, as plans progress, the community will have opportunities to play a part in the making of elements of the mosaic and to contribute to the project. Mosaic artist Ruth Ames-White, the designer of the project said: "I'm really excited about the positive progress being made and thoroughly enjoying the research and design - to which we are hugely indebted to our fantastic team of experts. It will also be great to work with schools and community groups as we move forward. Despite having lived in and around Wells for 45 years, I'm amazed how much of the rich and varied history of our city there is still to learn." Steve Wilson, of Wells Lions, first proposed the idea and is delighted to see it gain so much support. Wells Civic Society and the Lions have given funding to kick start the project. Chris Winter, chair of the society said: "This is a long term project and we are looking at ways to set up funding to cover maintenance in perpetuity." 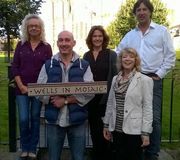 Ruth and Ian Ames-White will be giving a presentation about Wells In Mosaic on Wednesday, October 12 in Wells Museum at 7.30pm. All are welcome. VIPs came to see the quality of the work on the ambitious Wells in Mosaic project. Church Commissioner Paul Lewis came from Sussex and his senior colleague Simon Maybee from Hampshire to the mosaic studio in the city. The journey was shorter for the Bishop of Bath and Wells, Peter Hancock and Bishop's Palace chief executive Rosie Martin. The plan is to create a mosaic six metres in diameter on the lawns between the palace and the Bishop's Eye which will act as a tourist attraction and tourist guide. Ian Ames-White, one of the four organisers of the project, told the VIPs how the mosaic would be strong enough to take the weight of a lorry. Archeological surveys are being carried out and the next steps are to get a licence to put the mosaic on the lawn from the Church Commissioners and apply for planning permission from Mendip District Council. The commissioners own the land and manage the historic property assets of the Church of England. "We've had a great deal of behind the scenes support to enable us to get this far with the project," said the mosaic's designer Ruth Ames-White. "Today's meeting was very positive and felt like a big step in the right direction." A large public art mosaic is to be installed in the grounds of The Bishop's Palace, Wells. The 30 square metre mosaic, to be made using unglazed ceramic tiles, will feature a map of Wells city centre, the moat and many interesting facts from throughout Wells' history. I will manage the design and making of the mosaic, while Steve Wilson, Philip Welsh and Ian Ames-White will manage the multitude of other tasks involved. This public fund-raising project will run in partnership with Wells Lions and Wells Rotary Club. If you would like to know more or get involved in fund-raising by sponsorship or donation, please email Steve. Follow progress on my Facebook Page. I am delighted that my mosaic of St. Bride's Spire has been selected to be part of a BAMM exhibition in London. For the past few months, a class of talented Year 8 choristers and musicians attending Wells Cathedral School have been very busy creating mosaics. The project was the idea of Linzi Stockdale-Bridson, Head of Art at Wells. The students, having drawn out their design ideas on paper, begun applying tiles to the cleverly cut mdf instruments. 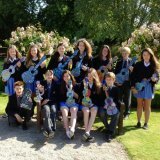 Week by week the guitars, violins, trumpet and grand piano shapes developed into some fantastic works of art by the pupils. This culminated in a exhibition of their wonderful mosaics in the art department followed by a second display in the events marquee for the end of year school Speech Day. After 11 weeks and in excess of 400 hours work, Arcus is complete. He had a short journey this morning, transported by an expert team of swan handlers, to his home for the next few months in the window of Junior Toys, Wells High Street. 'Swans of Wells' ... Sixty elegant swan scultures have been sponsored by businesses in the surrounding area of Wells Somerset and are currently being adorned with a variety of mediums by a range of local artists. The event is in celebration of The Queen's Diamond Jubilee. Once completed, all of the 5ft swans will be displayed, throughout the summer months, at locations throughout the city and beyond. A trail map will indicate where they are to be found. In late September a grand swan auction will take place, the proceeds of which will be donated to local charities.